No matter where you live, the hustle and bustle of everyday life can quite literally get under your skin. Whether harsh elements, work stress, hormones, or personal drama are causing you despair, your body’s largest organ – your skin – is sure to show it. Thanks to science, we can not only calm down our hyper-agro skin, we can actually prevent the freakout from happening altogether. Instead of immediately resorting to covering your redness with a thick mask of makeup, tell your face to take a chill-pill with Cover FX Calming Primer ($38). Flaky scalp getting in the way of your favorite black shirts? Look no further than L’Occitane Aromachologie Soothing Scalp Oil ($26). 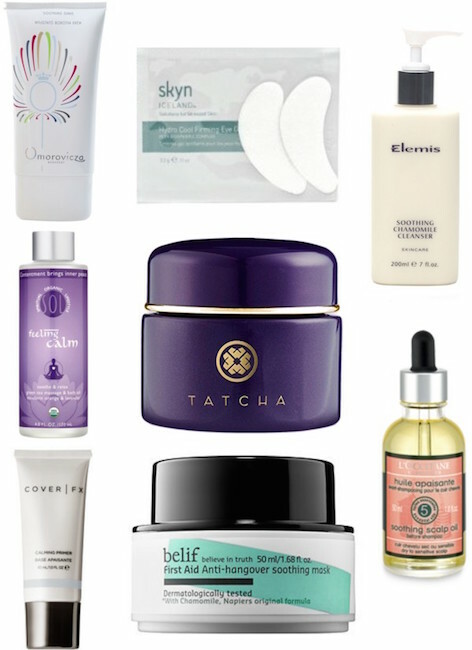 Many anti-aging products can be a bit harsh, but Tatcha Triple Recovery Cream ($135) is safe for even those suffering from eczema. For many of us, shaving can be incredibly irritating. Omorovicza Soothing Shave ($30) has Hungarian minerals with anti-inflammatory properties to calm while moisturizing, making razor-to-skin hair removal that much more tolerable. Belif First Aid Anti-Hangover Soothing Mask ($34) isn’t only good after a rough night out. Any time your visage is stressed or irritated, pop this on to wake up with an instantly healthier glow. After a long day, few things feel better than a warm bath with FeeLING Calm Massage & Bath Oil ($70). It’ll subside mental and physical stress with a one-two-punch. Harsh winter conditions and too-hot water can make washing your face a rather unpleasant experience. Turn down your tap and use Elemis Soothing Chamomile Cleanser ($36) to cleanse without upsetting your skin. Under eyes are one of the first areas to show signs of skin (or personal!) distress. Luckily, Skyn Iceland Hydro Cool Firming Eye Gels ($30) are like a magic fix. What do you use when your skin is freaking out? Let us know in the comments below!